Emma and I have been friends since we were 15 years old. I had successfully secured a place at The Dance School of Scotland, a full time vocational dance school in Glasgow. I was visiting for the first time after my audition to have a look around, watch a ballet class, check out our halls of residence, and meet the teachers. That day will forever be imprinted in my memory, for it was the first day of the rest of my life. I knew that by getting a place at the school, I was about to embark on a journey that I had always longed for. I had known since I was as young as 8 years old that I would be a dancer, and by being at this school, my dreams were falling into place. The class I watched was Emma's class. Everyone in that class had something special. I had never seen such a high standard of ballet before, only in a theatre. I knew then that I had a lot of work to do, but that I was in the right place to do it. When I started in the autumn term, I was in Emma's year. Emma and I soon became firm friends. I suddenly felt like there was someone who was just like me. Emma had the same outlook on life, the same passion, the same dream. We became as close as sisters, going on holiday together, sharing our secrets, planning our lifes. Those days were filled with excitement about what was yet to come. After school finished at 17, We decided to go to the same performing arts college in London. We lived together, worked hard and worked through our insecurities about life after college, we were still excited about becoming professional dancers, but we were nervous. What if it didn't work out for us? What if the competition was too great? We also faced the day when we had to go our separate ways, we couldn't stay together forever. 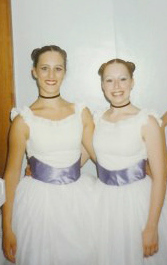 Emma and I were blessed to have professional dance careers lasting over 10 years, which for a dancer, is good innings! But, of course, we were no where near each other for those years. We would visit each other when we could, but it was very rarely. We managed to meet up in the Bahamas for a day once and we laughed at how strange it all was! We kept in contact and went about our own lives, but it's a funny thing, you never really know how much you have missed someone until you are with them again. Every time Emma and I saw each other, it was like no time had passed, except we were both more wordly, a bit older and more confident. A couple of years ago, we both realised that we still had the exact same interests, and that instead of performing we wanted to give back. We both felt it was time to pass on all that we had been taught and loved so passionately when we were younger. The joy that we get from dance is always there, and to help children find that joy is priceless. So we set up Tippy Toes Ballet, and whatever people say about not mixing friendship with business just doesn't seem to apply to us. We have such similar ideas and ways of doing things that we only help to spur each other on. We have always been there for each other, cheering each other on, helping each other see their true potential, and with Tippy Toes Ballet there is no difference. There is no better way to share a passion, than with a true friend like Emma.